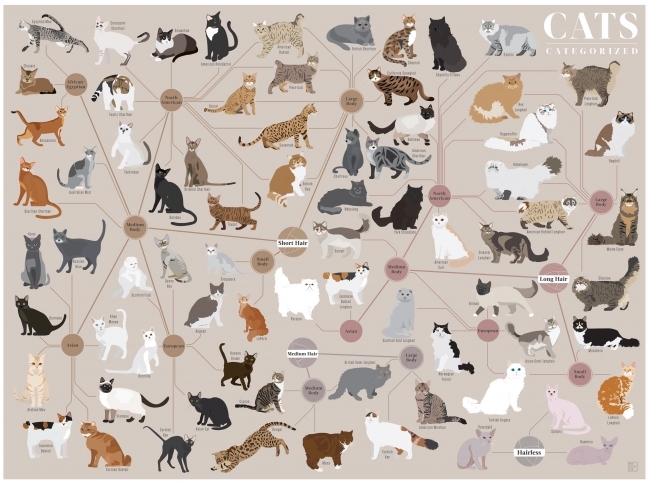 In one of their latest prints, Pop Chart Lab chart down the many breeds of domestic house cats. Meow hear this—we’ve scratched together a chart for pet lovers of a certain purr-suasion: those with a keenness for cats! Wondering what cat-egory your favorite fuzzy feline falls into? Re-fur to this expert examination, which maps out a multitude of hand-drawn mousers--by coat length, body size, and even geographic origin. Whether you yarn for Persians, Balinese, or Scottish Folds, this litany of litter-al kitties is veritable catnip for fans of furballs and infographics alike.